Here are some of our favorite releases from this past week! The Neighbourhood’s newest EP entitled ‘Ever Changing” came out last week and as the title aptly provides, The Neighbourhood continue to revel in their fluidity as a group. Since their breakout with ‘Sweater Weather,’ The Neighbourhood has dabbled in various genres and hip-hop is not one they’ve shied away from. ‘Ever Changing’ follows their self-titled album which sonically, touched back down to their roots as an indie pop group, but ‘Ever Changing’ is much more reminiscent to ‘#000000 & #FFFFFF’ (Black & White), the mixtape they released in 2014. Collaborating with Denzel Curry, Ghostface Killah, and Nipsey Hussle, The Neighbourhood hit once again in the same way they did with the mixtape. With a dynamic combination between lo-fi pop and hip-hop, The Neighbourhood’s ventures into hip-hop always bring a unique touch to the genre. ‘Ever Changing’ is yet another intriguing and memorable project from a band who always keeps you on your toes. PROJECT BABY! Kodak comes back with his first release post-prison and it’s everything we needed. ‘If I’m Lyin, I’m Flyin’ is a super nostalgic song for all Kodak fans and it seems like he released this to remind us all that he’s far from departing from the eclectic sound that made gained him notoriety in the first place. In case you wouldn’t have guessed it, Kodak comes back with this song to talk about his time in prison and how he claims to have had some self-realizations that he needs to get things together. It’s honestly hard to not think about certain flaws in both the prison and governmental system as a whole when Kodak mentions that he’ll be 31 when he’ll be able to see some of his people again. The production on this perfectly supports Kodak’s endless bars of experiences and thoughts from inside the Pen. Welcome home my boy. The Blonde Tongues follow up their EP ‘The Anxiety Dream’ w/ their latest single release ‘Turn Me Out.’ The Tampa, FL surf/garage-rock band opens up the single with the in-your-face, titled track ‘Turn Me Out’ which is very reminiscent to other beach side bangers that guys like Weezer and Wavves have made popular in the past. ‘Rain Check’ follows the high energy of ‘Turn Me Out’ and brings us down into a tripped-out hole of bouncing tempos, heavy reverb, and wallowing soundscapes before closing out with it’s more-than-catchy, hook: “Raiiiinnn cheeeecckkkkkkk! 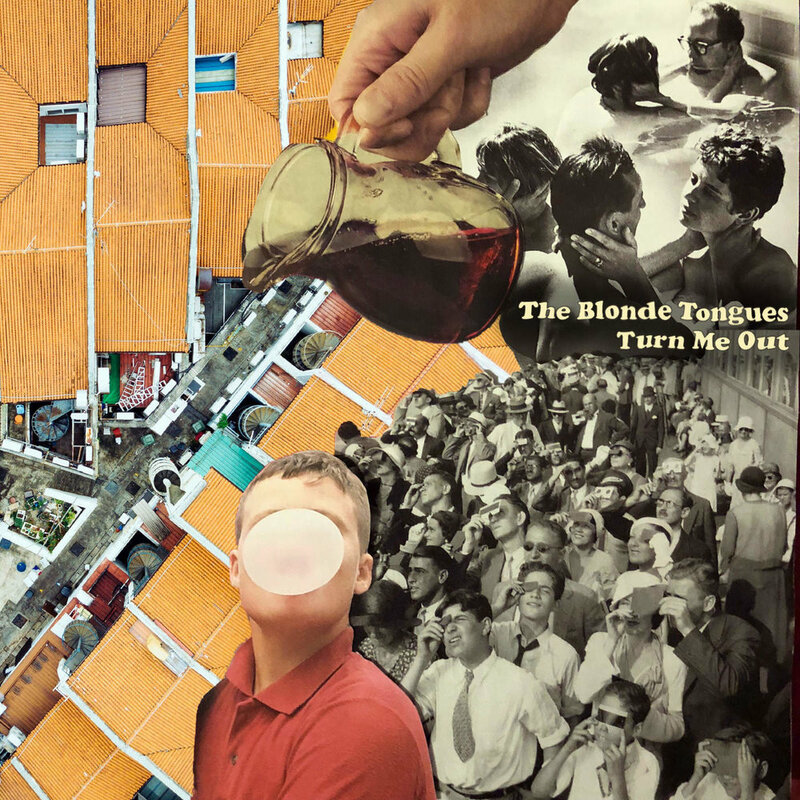 !” The Blonde Tongues continue to improve and perfect their craft as Florida’s premier garage-rock outfit. Sun Sign’s latest release Dopeless Hope Fiend is bold and true to it’s roots, which is rare in today’s music scene. The 5 song-EP gives us a true feeling of “rock-n-roll” with the looseness of the distorted guitars as the band freely moves around and experiments from the first second of the project to the last. The title track opens the EP with a long, transcendental instrumentation of guitars and reverb that sets you up for the rollercoaster ride you’re about to take on. For me, the rest of the project carries a lot of elements that bands like Brand New (in their last two releases), Manchester Orchestra, and The Gaslight Anthem used in honing in their sound. This EP is definitely worth a listen and we’re waiting on pins and needles for their follow up to this already! Walter Kovax, a lo-fi artist from Ohio comes with his third single: ‘Last Time’. This song brings us a murkier sound compared to Kovax’s previous two singles ‘Oh Dear’ and ‘Reflection.’ The eerie instrumental of ‘Last Time’ perfectly compliments Kovax’s effortlessly droning vocals, which are reminiscent of artists like King Krule, Wicca Phase, and Mac Miller. ‘Last Time’ is the second of three singles loosely released together by Kovax, with ‘Oh Dear’ being the first. We can’t wait to see what else Kovax brings for us in the future!